Michalis Moschoutis is a musician based in Athens – Greece. 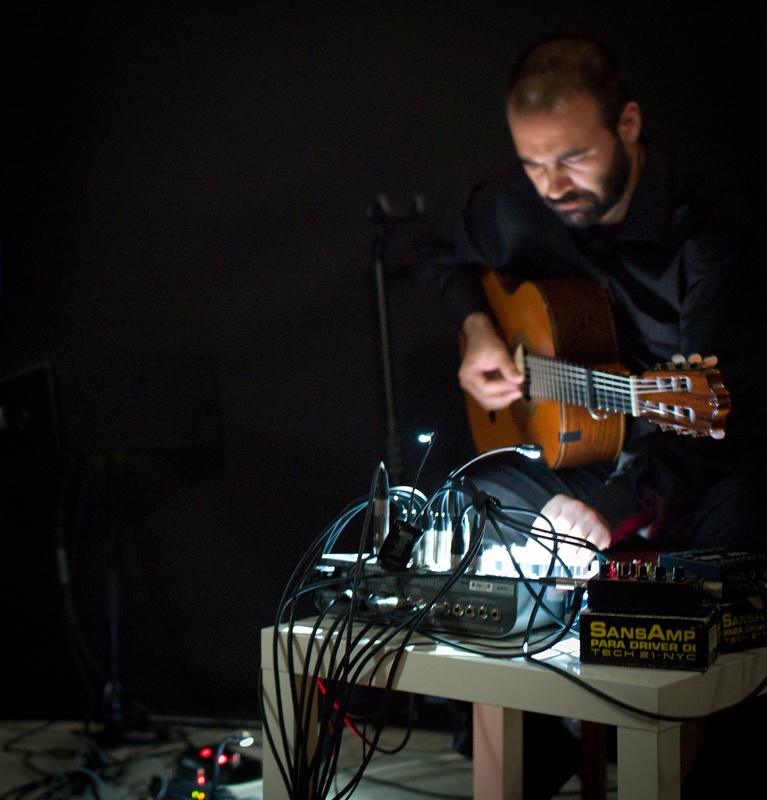 Primarily concerned with contrast, he creates works that lie on the fringes of several genres: heavy processing and live electronics; restrained and unadorned improvisation that brings out the inherent primitivism and ritualism of music; cathartic dark metal; the plainness and intimacy of 16th – 17th century lute works; and the subtle fluctuations of minimal drone music. Michalis Moschoutis studied classical guitar and theorbo at the Guildhall School of Music in London and at the Royal Conservatoire in the Hague. Since the mid 00’s he has adopted less conventional approaches to the guitar, working with extended techniques on various guitars; nylon string, acoustic, electric, lap steel and pedal steel guitars. His live performances range from acoustic solo sets, to heavily amplified feedback-drenched performances and concerts for electronics, string quartets, brass and wind ensembles. Moschoutis is one-half of the duo APNOEA and has released music under the moniker Kerkville. Lately his artistic output has expanded to site specific and concept-driven projects like the recent Offerings that involved recording a new piece everyday over the 48 days of lent. He curates In Mute Festival, the Athens music festival that presents unexpected coexistences of silent era films and cutting-edge experimental music. Throughout 2010 – 2011 he organized a weekly series of audio-visual events called Early Nights at the Harmonium. His music has been frequently used in films and documentaries. At the same time Michalis Moschoutis has a longstanding interest in education. He teaches in schools and conducts children’s workshops involving field recording and improvisation. He regularly performs in Athens and has given concerts in Spain, Great Britain, The Netherlands, Germany and Iceland.